To Cite: Jafari A, Pouramir M, Shirzad A, Motallebnejad M, Bijani A, et al. Evaluation of Salivary Alpha Amylase as a Biomarker for Dental Anxiety, Iran J Psychiatry Behav Sci. 2018 ; 12(1):e9350. doi: 10.5812/ijpbs.9350. Background: The anxiety of dental conditions is very common. Salivary alpha amylase (SAA) enzyme, as a non-invasive biomarker, is considered in assessing dental anxiety. Objectives: The present study aimed at investigating the relationship between salivary alpha amylase level and dental anxiety before and after dental restoration. Methods: In this longitudinal study, which was performed in Babol dental faculty during 2015 and 2016, a total of 99 patients (50 females and 49 males) were selected using simple sampling method. To measure anxiety, the patients completed modified dental anxiety scale (MDAS) and demographic questionnaire. Unstimulated whole saliva was collected 3 times: at the day of dental examination in a stress- free condition; immediately before dental restoration; and 15 minutes after dental restoration. Salivary alpha amylase activity was measured by the Caraway starch-iodine modified method. SPSS 20 software and t test, chi square, Pearson correlation, and ANOVA repeated measurement were used for data analysis. Results: Levels of salivary alpha amylase increased before dental restoration and reduced after dental restoration (P value < 0.001). The alpha amylase level before dental restoration significantly correlated with modified dental anxiety scale (P value < 0.001). Levels of alpha amylase did not show any significant relationship with any of the variables, such as age, gender, level of education, and dental traumatic experience (P value > 0.05). Conclusions: Salivary alpha amylase can be used as a reliable objective tool for measuring anxiety of dental treatment. Dental anxiety is very common among population of many countries. Several etiologies including internal factors (personality traits) and environmental factors (age, gender, education, etc.) are involved in its development (1-3). Studies have shown that dental anxiety can cause decayed-missing- filled teeth index (DMFT) increase, restrict the provision of oral health care services, increase in emergency dental referrals, jeopardize dentist-patient relationship, decrease oral health quality of life, and psychosocial health (1, 3). All these cases lead to a defective cycle that ultimately creates more anxiety in the patient (4). Among the main benefits of measuring anxiety of the patients is that the dentist is able to diagnose anxiety for the patient before treatment, and resolve them as much as possible. Many studies have been conducted to measure dental anxiety by various questionnaires including MDAS (3). MDAS questionnaire was utilized as a subjective standard criterion to measure anxiety and it was answered by the patients. The reliability and validity of this questionnaire have been reviewed and approved in different languages including Farsi (5-9). However, if some patients are not able to respond reliably (20% of the patients in this study), then, this tool will have a limited value (10). Thus, the utilization of biomarkers is considered as an alternative objective criterion for measuring the level of anxiety in recent studies. Research on the use of salivary biomarkers, such as cortisol and Chromogranin A, has been performed to predict dental anxiety and fear. However, positive relationship between them and the dental anxiety remains unclear. Salivary alpha amylase (SAA) was considered as a suitable biomarker of sympathetic nervous system activity in recent years (11). Alpha amylase enzyme is one of the most important enzyme compositions in the saliva that accounts for 40% to 50% of the total salivary proteins, and most of it is secreted from the parotid gland. SAA plays an important role in carbohydrate hydrolysis. Furthermore, alpha amylase can also play a role in the oral immune system (12). Anxiety causes activation of the sympathetic nervous system (SNS) and hypothalamic-pituitary-adrenal axis (HPA). By activating SNS, the release of epinephrine and norepinephrine is initiated from adrenal center, and finally norepinephrine increases the secretion of SAA from parotid and submandibular acinar cells. SAA measurement, when compared to serum catecholamine measurement, is very simple, non-invasive, without stress, and with high repeatability potential. On the other hand, because SNS is considered as a rapid response system, it is suggested as a better scale for measuring stress when compared to the HPA system markers (1, 13). Since the anxiety of dental restorations can probably cause significant changes in SAA, the present study aimed at evaluating SAA changes in anxiety before and after dental restoration. Also, this objective criterion was compared with the standard questionnaire of MDAS. The Purpose of present study was to investigate the relationship between salivary alpha amylase level and dental anxiety before and after dental restoration. This longitudinal study was performed on patients referring to Babol dental faculty during 2015 and 2016. The sample size was determined based on previous studies and according to a statistical advisor. A total of 99 individuals (49 males and 50 females) were selected using simple sampling method. After explaining the purpose of the study to all patients, written consent was obtained from all of them. Inclusion criteria for this study were as follow: Healthy adults aged 19 to 51 years who were literate, had no systemic disease, were not on medication, and needed premolar or molar composite restoration, with unification of infiltration injection. Pregnant women, women using oral contraceptive, women who were in their menstrual cycle, patients who used inhaled steroids, patients who used any medication that could affect salivary glands (such as antihypertensive, antidepressants or antipsychotic drugs), patients with xerostomia, those with smoking and drinking habits, presence of severe periodontitis, rapidly progressive decay, presence of any oral lesions, the use of any oral appliance (such as orthodontics, complete and partial prosthesis), and patients with spontaneous pain. The patients were also asked to avoid eating, drinking, and brushing at least 90 minutes before sampling. To prevent the effects of circadian rhythm of this enzyme, all samplings were performed at 5 to 7 pm. After signing a consent agreement, the patients filled out the demographic questionnaire (age, gender, education, history of dental pain and painful dental extraction) and MDAS questionnaire. MDAS questionnaire includes 5 questions that measure anxiety levels in each question on a 5- point scale. Replies were scored considering the increasing severity of dental anxiety from 1 to 5, so the attainable score was variable from a minimum of 5 (no distress) to a maximum of 25 (the extreme anxiety). Those with scores of 6 to 11, 12 to 18, and 19 to 25 were classified as patients with low, moderate, and severe anxiety (Dental phobia) (3). 1, when the patient referred for initial examination and took turns for dental restoration while having no stress. Therefore, alpha amylase level could be considered as a baseline for each person; 2, immediately before dental restoration; 3, 15 minutes after dental restoration. Salivary sampling was performed in such a way that 2 mL of saliva was prepared using spitting method (14). After collecting saliva in the test tube, it was encoded and sent to biochemistry laboratory. Saliva sample was centrifuged for 20 minutes at 3500 rpm until the debris was removed. The supernatant was transferred into microtubes, encoded, and maintained at -80°C until test time. To measure SAA enzyme activity, frozen specimens were kept for about half an hour at room temperature. Data were analyzed using SPSS 20 software, and statistical tests of ANOVA repeated measurement and LSD post hoc test, t test, chi square, and Pearson correlation. P value < 0.05 was considered as statistically significant. A total of 99 (50 females and 49 males) people participated in this study, with a mean age of 30.35 ± 9.35. A total of 44 patients (44.4%) had high school diploma or were high school dropouts, while 55 patients (55.6%) had college degrees. In this study, 36 patients (36.4 %) had experienced painful tooth extraction, 63 (63.6%) did not have such experience, 70 (70.7%) had a history of dental pain, and 29 (29.3%) had no history of dental pain. Average scores of MDAS questionnaire was 10.08 ± 3.77. There were no significant correlations among age, gender, education level, history of dental pain, and painful tooth extraction with average of MDAS questionnaire scores; in all cases, P > 0.05 value was obtained. The first time, alpha amylase average was 1348.08 ± 53.93 (U/L), it was 1387.85 ± 48.51 (U/L) in the second time, and 1331.27 ± 52.94 (U/L) in the third time. 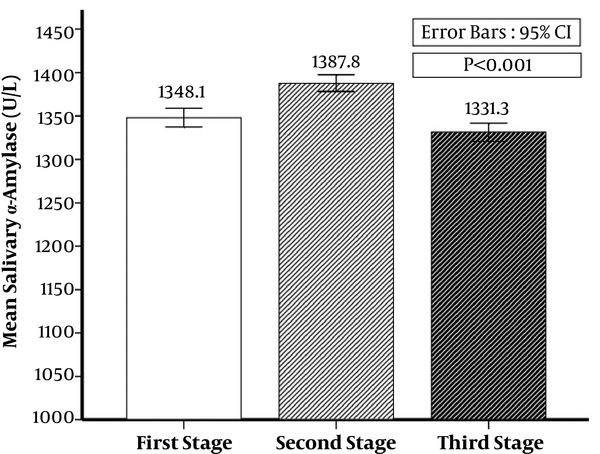 There was a significant difference among the first, second, and third time alpha amylase average (P < 0.001) (Figure 1). No significant relationship was observed among alpha amylase average of the first, second, and third steps with gender, history of painful tooth extraction, and history of dental pain (Table 1). aValues are expresser ad mean ± SD. This correlation was not found with age (P > 0.05). In this study, given that the number of people with severe anxiety was small, MDAS was divided based on 2 groups of low anxiety and sum of moderate and severe anxiety. There was a significant relationship between the MDAS questionnaire and alpha amylase in the second step (Table 2). MDAS questionnaire is used as a subjective criterion to measure dental anxiety. However, if some patients are not able to respond reliably, such tools will be of limited value (10). Thus, the use of biomarkers as an alternative objective criterion to assess psychological and biological stress that are easy to use and accurate enough, have been of interest in recent studies. Several studies were conducted to evaluate the effect of various stressors, such as process of bloodletting, stressful videos, intellectual computational processes on alpha amylase, and cortisol levels in saliva (15-19). Nevertheless, few studies have examined the effects of stressful dental procedures on alpha amylase in saliva. In this study, correlation between SAA level with anxiety caused by dental restoration was examined, and a significant difference was found between SAA activity before and after dental restoration. In our study, SAA increased substantially before the start of dental restoration and rapidly reduced after work. Results of the study by Furlan et al. on children who underwent dental prophylaxis also showed a higher level of SAA at the beginning of treatment than at the end of treatment (13). Increase of SAA level before the stressful process of venipuncture has been reported in another study. This rate still remained at a high level of 15 minutes after the end of treatment due to the presence of pain stimulus (15). In the same study that utilized a corneal transplant surgery video as stressful process, similar results to the results of the present study were obtained (17). In the study by Sadi et al., increase of SAA in patients undergoing routine dental examinations was not observed (1). Various reasons can justify this lack of correlation in the study by Sadi because in this study, saliva samples were taken only once and before examining patients, and the patients had no history of dental treatment and dental pain. Moreover, they were aware that they are undergoing a routine dental examination. In our study, saliva samples were performed 3 times: when the patient referred for initial examination and took turns for dental restoration while having no stress. Therefore, alpha amylase level could be considered as a baseline for each person; immediately before the beginning of restoration for measuring SAA level in stressful conditions; and 15 minutes after the end of the treatment for measuring SAA level after stressful process. Sympathetic system is known as a nervous system with fast response to stressful stimuli. Due to stressful stimuli, activity of this system causes increase of plasma norepinephrines. Also, salivary glands that are the main SAA secreting source and have a large number of beta adrenergic receptors are stimulated by plasma norepinephrines. As a result, stimulation of the sympathetic system causes rapid increase in production and release of the SAA. Moreover, alpha amylase is reduced by elimination of stressful stimuli (17, 20). According to the results of this study, in those with higher anxiety level (according to the results of MDAS questionnaire), more increase was observed in the alpha amylase level before dental restoration. However, there was no change in baseline alpha amylase level and alpha amylase level after dental restoration. In another study, similar to our study, showed a clear correlation between STAI questionnaire scores and the SAA level before displaying the corneal surgery film (15). In another study, which used a mental arithmetic task process as stressful stimuli, a significant relationship was found between Spielbergers state-trait anxiety inventor (STAI) scores and SAA level before a stressful process. STAI is a standard questionnaire that measures general anxiety) (17). However, Sadi et al. did not find any correlation between scores of the Corah’s DAS and SAA questionnaires (1). This lack of relationship may be due to sampling saliva in a non-stressful situation and lack of dental pain history of the participants under study. In this study, MDAS questionnaire was used to measure dental anxiety level. The questionnaire was filled by individuals and it was a subjective measure of personality characteristics of dental anxiety. On the other hand, the main systems associated with stress in human body are HPA and SNS. Catecholamines is the serologic mediator’s activity of the sympathetic system. Two major markers are found in saliva, which are associated with these 2 systems. Cortisol is related to HPA systems, and alpha amylase is associated with SNS system. Several studies have shown that cortisol shows a less increase in stimulation time and reach its peak in a longer time than SAA, as the sensitivity of sympathetic system is higher than HPA system. Thus, SAA level represents individual’s response to stress more accurately and sensitively (17, 21). Therefore, it can be stated that there is a relationship among personality characteristics, with more anxiety and alpha amylase rate that represents SNS system. Based on results of the present study, no correlation was observed between factors of age, gender, education, and a painful dental extraction with MDAS questionnaire mean scores. According to a study, no significant relationship was observed between anxiety level based on Corah’s DAS questionnaire mean score with age, gender, and race (1). Results of the study by Oktay et al. indicated no relationship between education level and age with dental anxiety based on scores of Corah’s DAS questionnaire, but women and those with past traumatic experience showed higher levels of anxiety (22). Contradiction in the results of these studies could prove that anxiety is a multifactorial process, and unknown genetic and environmental factors can affect it; on the other hand, the differences among the design of the studies, different age groups, and different cultures can also cause these inconsistencies, which need to be further examined in future studies. In this study, results indicated that such factors as age, gender, history of painful tooth extraction, and history of dental pain did not affect SAA level. Noorani et al. observed no differences in SAA activity in 5 to 12 year old children in both genders (11). Nonetheless, in a research using a corneal transplant surgery video as stressful stimuli, the researchers obtained a more increase in SAA level in younger men (12). The reason for this difference was the type of stressful stimulus, time, and conditions of the study. In a study by Koh, evidence of the impact of age on SAA activities was found (15). Lack of relationship between these factors and level of SAA in the present study suggest that tooth restoration as a stressful process itself increases actual SAA activity and possible factors confounding SAA activities such as age, gender, and history of painful tooth extraction; moreover, history of dental pain did not have much impact on alpha amylase. Limitations of this study were the absence of people with severe anxiety (according to MDAS questionnaire). Therefore, it is best to use more individuals with severe anxiety in future studies. Also, in this study, the flow rate was not investigated. However, the relationship between flow rate and the alpha amylase has been reported to be contradictory in different studies (23). The present study demonstrated that SAA activity was higher among those participants with greater MDAS score. No significant relationship was observed between SAA level and the scores of the MDAS questionnaire with the variables of age, gender, education, and traumatic dental experience. SAA can be considered as one of the valuable indicators of dental anxiety. This article was extracted from the thesis by Atefeh Jafari (number 944015). The authors would like to appreciate the deputy of research and technology of Babol University of Medical Sciences for their financial support of the study. Authors’ Contribution: Atena Shirzad and Mina Motallebnejad designed the manuscript, analyzed the data and interpretated. Atefe Jafari, Zohre Dastan, Atena Shirzad, Mahdi Pouramir drafted the manuscript. Atena Shirzad, Atefe Jafari, Mina Motallebnejad, Susan Moudi revised critically the manuscript for important intellectual content. Atefe Jafari, Mahdi Pouramir, Atena Shirzad, Mina Motallebnejad, Ali Bijani, Sussan Moudi, Faeze Abolghasem-Zade, and Zohre Dastanm analysed statistical data. Ali Bijani, Atena Shirzad supervised the study. All authors read and approved the final manuscript. Funding/Support: Deputy of research and technology of Babol University of Medical Sciences supported this project. 1. Sadi H, Finkelman M, Rosenberg M. Salivary cortisol, salivary alpha amylase, and the dental anxiety scale. Anesth Prog. 2013;60(2):46-53. doi: 10.2344/0003-3006-60.2.46. [PubMed: 23763559]. 2. Thomson WM, Broadbent JM, Locker D, Poulton R. Trajectories of dental anxiety in a birth cohort. Community Dent Oral Epidemiol. 2009;37(3):209-19. doi: 10.1111/j.1600-0528.2009.00473.x. [PubMed: 19508269]. 3. Lopez-Jornet P, Camacho-Alonso F, Sanchez-Siles M. Assessment of general pre and postoperative anxiety in patients undergoing tooth extraction: a prospective study. Br J Oral Maxillofac Surg. 2014;52(1):18-23. doi: 10.1016/j.bjoms.2013.01.004. [PubMed: 23357053]. 4. Dobros K, Hajto-Bryk J, Wnek A, Zarzecka J, Rzepka D. The level of dental anxiety and dental status in adult patients. J Int Oral Health. 2014;6(3):11-4. [PubMed: 25083026]. 5. Javadinejad S, Farajzadegan Z, Sherkat S, Shokri Mozhdehi M. Reliability and Validity of the modified retranslated persian version of child dental anxiety scale in comparison with corah's dental anxiety scale and venham picture test. J Res Dent Sci. 2014;11(2):112-5. 6. Humphris GM, Morrison T, Lindsay SJ. The Modified Dental Anxiety Scale: validation and United Kingdom norms. Community Dent Health. 1995;12(3):143-50. [PubMed: 7584581]. 7. Coolidge T, Hillstead MB, Farjo N, Weinstein P, Coldwell SE. Additional psychometric data for the Spanish Modified Dental Anxiety Scale, and psychometric data for a Spanish version of the Revised Dental Beliefs Survey. BMC Oral Health. 2010;10:12. doi: 10.1186/1472-6831-10-12. [PubMed: 20465835]. 8. Coolidge T, Arapostathis KN, Emmanouil D, Dabarakis N, Patrikiou A, Economides N, et al. Psychometric properties of Greek versions of the Modified Corah Dental Anxiety Scale (MDAS) and the Dental Fear Survey (DFS). BMC Oral Health. 2008;8:29. doi: 10.1186/1472-6831-8-29. [PubMed: 18826612]. 9. Yuan S, Freeman R, Lahti S, Lloyd-Williams F, Humphris G. Some psychometric properties of the Chinese version of the Modified Dental Anxiety Scale with cross validation. Health Qual Life Outcomes. 2008;6:22. doi: 10.1186/1477-7525-6-22. [PubMed: 18364045]. 10. Guglielminotti J, Dehoux M, Mentre F, Bedairia E, Montravers P, Desmonts JM, et al. Assessment of salivary amylase as a stress biomarker in pregnant patients. Int J Obstet Anesth. 2012;21(1):35-9. doi: 10.1016/j.ijoa.2011.09.008. [PubMed: 22119632]. 11. Noorani H, Joshi HV, Shivaprakash P. Salivary Alpha Amylase as a Noninvasive Biomarker for Dental Fear and Its Correlation with Behavior of Children during Dental Treatment. Int J Clin Pediatr Dent. 2014;7(1):19-23. doi: 10.5005/jp-journals-10005-1227. [PubMed: 25206232]. 12. Sahu GK, Upadhyay S, Panna SM. Salivary alpha amylase activity in human beings of different age groups subjected to psychological stress. Indian J Clin Biochem. 2014;29(4):485-90. doi: 10.1007/s12291-013-0388-y. [PubMed: 25298630]. 13. Furlan NF, Gaviao MB, Barbosa TS, Nicolau J, Castelo PM. Salivary cortisol, alpha-amylase and heart rate variation in response to dental treatment in children. J Clin Pediatr Dent. 2012;37(1):83-7. doi: 10.17796/jcpd.37.1.n32m21n08417v363. [PubMed: 23342572]. 14. Navazesh M. Methods for collecting saliva. Ann N Y Acad Sci. 1993;694:72-7. doi: 10.1111/j.1749-6632.1993.tb18343.x. [PubMed: 8215087]. 15. Koh D, Ng V, Naing L. Alpha amylase as a salivary biomarker of acute stress of venepuncture from periodic medical examinations. Front Public Health. 2014;2:121. doi: 10.3389/fpubh.2014.00121. [PubMed: 25207265]. 16. Takai N, Yamaguchi M, Aragaki T, Eto K, Uchihashi K, Nishikawa Y. Gender-specific differences in salivary biomarker responses to acute psychological stress. Ann N Y Acad Sci. 2007;1098:510-5. doi: 10.1196/annals.1384.014. [PubMed: 17435161]. 17. Takai N, Yamaguchi M, Aragaki T, Eto K, Uchihashi K, Nishikawa Y. Effect of psychological stress on the salivary cortisol and amylase levels in healthy young adults. Arch Oral Biol. 2004;49(12):963-8. doi: 10.1016/j.archoralbio.2004.06.007. [PubMed: 15485637]. 18. Kang Y. Psychological stress-induced changes in salivary alpha-amylase and adrenergic activity. Nurs Health Sci. 2010;12(4):477-84. doi: 10.1111/j.1442-2018.2010.00562.x. [PubMed: 21210927]. 19. Noto Y, Sato T, Kudo M, Kurata K, Hirota K. The relationship between salivary biomarkers and state-trait anxiety inventory score under mental arithmetic stress: a pilot study. Anesth Analg. 2005;101(6):1873-6. doi: 10.1213/01.ANE.0000184196.60838.8D. [PubMed: 16301277]. 20. Campos MJ, Raposo NR, Ferreira AP, Vitral RW. Salivary alpha-amylase activity: a possible indicator of pain-induced stress in orthodontic patients. Pain Med. 2011;12(8):1162-6. doi: 10.1111/j.1526-4637.2011.01185.x. [PubMed: 21749637]. 21. Rashkova MR, Ribagin LS, Toneva NG. Correlation between salivary alpha-amylase and stress-related anxiety. Folia Med (Plovdiv). 2012;54(2):46-51. [PubMed: 23101285]. 22. Oktay EA, Koçak MM, Şahinkesen, G , Topçu, F. T . The role of age, gender, education and experiences on dental anxiety. Gulhane Med J. 2009;51:145-8. 23. Nater UM, Rohleder N, Gaab J, Berger S, Jud A, Kirschbaum C, et al. Human salivary alpha-amylase reactivity in a psychosocial stress paradigm. Int J Psychophysiol. 2005;55(3):333-42. doi: 10.1016/j.ijpsycho.2004.09.009. [PubMed: 15708646].